Angela Neel Interiors is proud to offer selections from numerous vendors and fully customize it to match your personal taste. One of our many vendors is Taylor King! Choose from the multiple styles of Taylor King furniture we have available in our showroom, located in the heart of Orlando, and we will completely customize them to suit your home. With over 40 years of experience, Taylor King takes pride in creating custom furniture handcrafted in the USA. As one of the nation’s leading manufacturers of American made upholstered furniture, Taylor King attributes their success to a commitment to quality and comfort. They have an unmatched selection of fabrics and textiles for your choosing. Angela Neel selects fabrics, wood, and furnishings from Taylor King and fully customizes it to create a completely unique piece. Angela Neel’s commitment to quality begins with the craftsmanship. We guarantee your furniture piece will be one-of-a-kind. Angela Neel offers a “Taylor Made” customizable program where you can build and design your own furniture. At our showroom, you begin with choosing the depth, back, seating arrangement, arm style, and base. We, at Angela Neel, supply samples of modern Taylor King fabrics (including Sunbrella and Crypton) and help you choose the best materials for your piece. This program is also available for beds and headboards, benches, ottomans, and dining chairs. A few Taylor King sofas are displayed in our showroom, such as the Malloy Sofa, for you to see and feel the high quality. 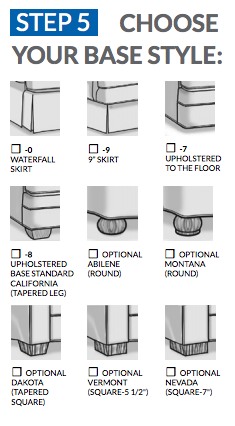 Designing your own seating arrangement with Taylor King furniture is simpler than ever before. 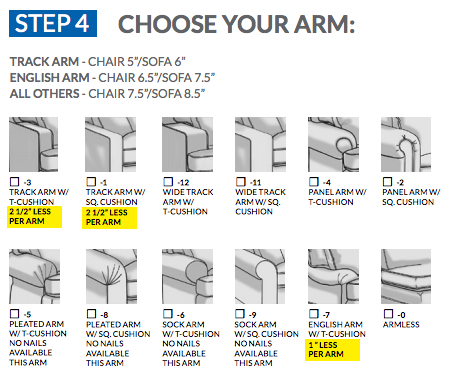 In five easy steps, you will be on your way to owning your very personal custom sectional, sofa, loveseat, or chair. Seat depth isn’t something many people take into account when designing seating, but it can have a huge impact on your long-term comfort. Our standard depth is typically 39.5”. Design it to perfectly match your living area, with Square, Round, Knife-Edge, and Box Border backs. Loose standard/semi-attached is optional. 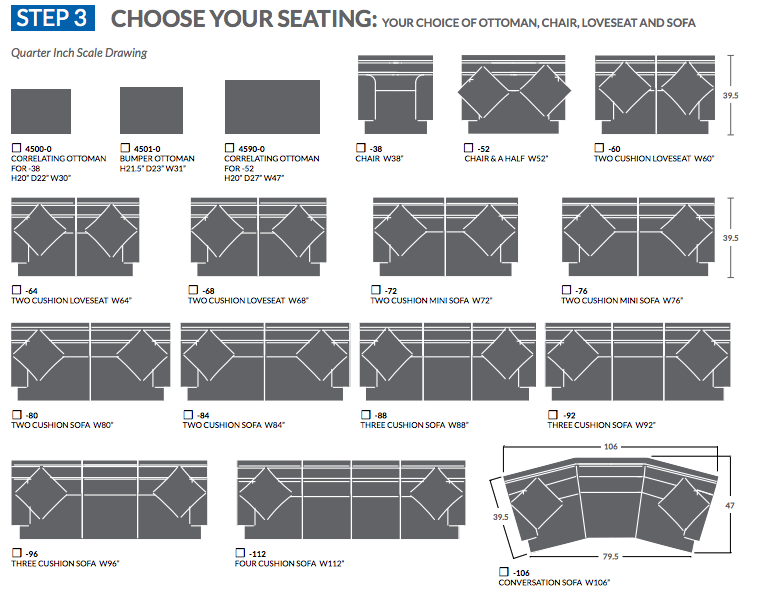 Select styles from ottoman, chair, loveseats and sofas. Select styles from Track arm, English arm, and others. What footing is best for your style? Each frame is upholstered by an experienced craftsman, one piece at a time. Fabrics are fully flow-matched to ensure a seamless connection of patterns and textures. Eight-way hand tied coil springs, either three or four rows deep, are used for the ultimate seating foundation. Nailhead trim is applied one nail at a time by experienced craftsmen. If you are looking to redesign your home or small space with custom furniture, Angela Neel Interiors knows just what you need. We offer several vendors that have various styles and designs that are sure to grab your attention. Our showroom is the perfect place to touch and feel the fabrics and quality of our furnishings. Feel free to sit on furniture, compare swatches for upholstery projects, take note of the lighting and art pieces, and ask our interior decorators questions. We are here to guide you along the process of turning your space into a haven. If you would like to come into our store, we are open from 10:00 am – 6:00 pm Monday through Friday and Saturday 11:00 am — 5:00 pm, or give us a call today! We look forward to helping you create a space that is unforgettable with our selection of quality furniture.